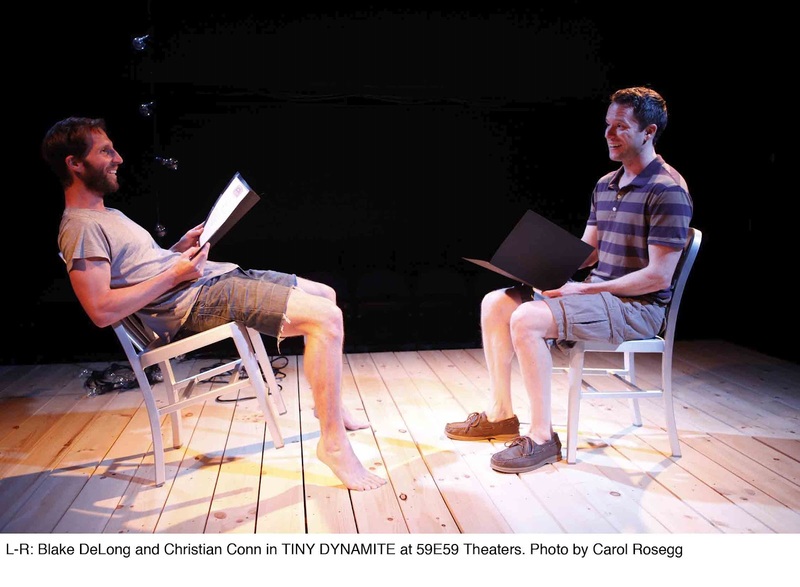 How It’s New York: Tiny Dynamite is presented by Origin Theatre Company, run by George C. Heslin, who present the NYC-based 1st Irish Festival, present “Mondays in May,” and productions of great European playwrights- like this one. Also, the play takes place at 59E59, one of the best Off-Broadway houses. How It’s (Celtic) Irish: Abi Morgan is Welsh. You can’t really see electricity. As with the wind, you see electricity’s effects. Or do you? It’s a powerful force, like love, memory, longing, or hope. Can it be controlled, or just contained? One thing you can’t do is deny it. A wall of clear lightbulbs stands on each side of the galley stage for Tiny Dynamite. You can see the filaments, some of which are blue, some orange.They light up in sequence or all at once and they change the way you see the characters on stage.There is also a rope of bulbs hanging from floor to ceiling.It’s a brilliant setting for Abi Morgan’s taut, shimmering play (set design by Maruti Evans; directed by Matt Torney). All three characters in Abi Morgan’s haunting play, produced by Origin Theatre Company, come to grips with nature, including human nature, as they hover around and collide with one another. Two friends, Lucien (Christian Conn) and Anthony (Blake DeLong) go on a summer holiday, where they meet free-spirited Madeleine (Olivia Horton). The story that starts off the show is that of “runt boy” and “shy boy,” which really is about the two of them as children.”Runt boy,” who was Anthony, was hit by lightning at age 6.Anthony is homeless, and likes it, he says. Lucien funds their yearly summer trip.Yet Anthony, while touched, is not retarded. His sardonic yet friendly replies get you on his side instantly. We’ll learn that Anthony was hit by lightning as a child, which accounts for both men’s obsession with freak accident stories. We’ll hear a few times about a sandwich dropped from the Empire State building that supposedly killed a woman below. If homelessness, lightning and mental illness weren’t enough to deal with, we’ll also discover that both men share a crippling guilt over the suicide of a woman they both loved. Lucien has coped with it by becoming a risk-manager, someone who always wants to know cause and effect. But some things cannot be controlled.Morgan’s natural yet lyrical writing manages to conceal even as it reveals.For my money the backstory is a little overplotted. But that’s just plot. There’s a lot more going on. Lucien’s stories depend on fear of the unkown. Anthony’s tend to have miracles, and happy endings. Is faith a mental illness, or is lack of it? And what about love – or fear? Certain words and stories recur in the play, like ghost images on a television screen or the inside of your eyelid: “miracle.” That sandwich, falling from the empire state building. Morgan also captures how three young people goof off and play. Madeleine at one point has to stop the two men from literally pinching each other. I think I’ve been at that all-nighter. All of Matt Torney’s innovations serve the play, and his pacing is outstanding. These are rare qualities in a director, and I’m looking forward to seeing more of his work. Torney’s compelling stage pictures are punctuated with eloquent sound effects, and the lightbulbs become characters themselves.Maruti Evans’ bare set with only two chairs, and limited yet soft lighting help create a fabulistic, ghost story feel.Will Pickens’ sound design, including the splash of a character diving, pull us into the world. 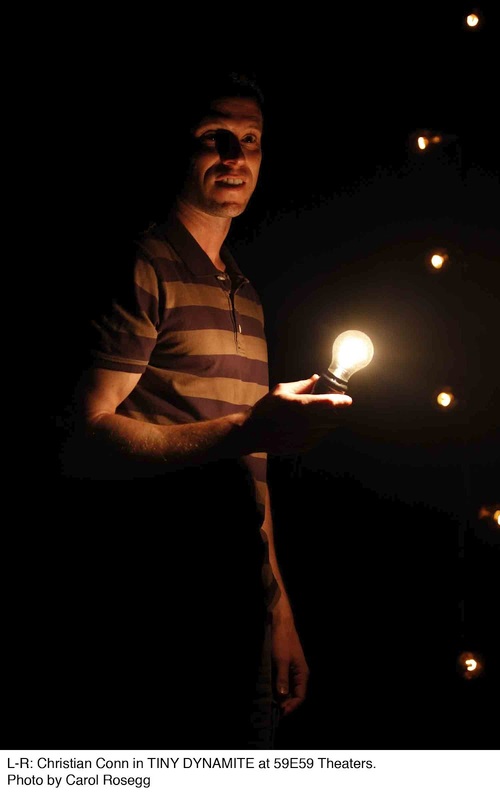 As Anthony, DeLong crackles with energy that sometimes switches off completely in a frightening way.His sizzling, mocking humor reassures even as when he seems close to exploding. Conn resembles a young Matt Damon who feels much more than he dares express; he’s a harder character to like but his insecurities make him impossible to write off. Then, too, we see the effect he has on the other two, who yearn for his full attention. Horton’s Madeleine radiates warmth and originality, with sensitive, expressive shadows that cross her face. She’s sweetly tough, in a floaty dress with short cowboy boots. Nicole Wee’s costumes unobtrusively tell us who these characters are. 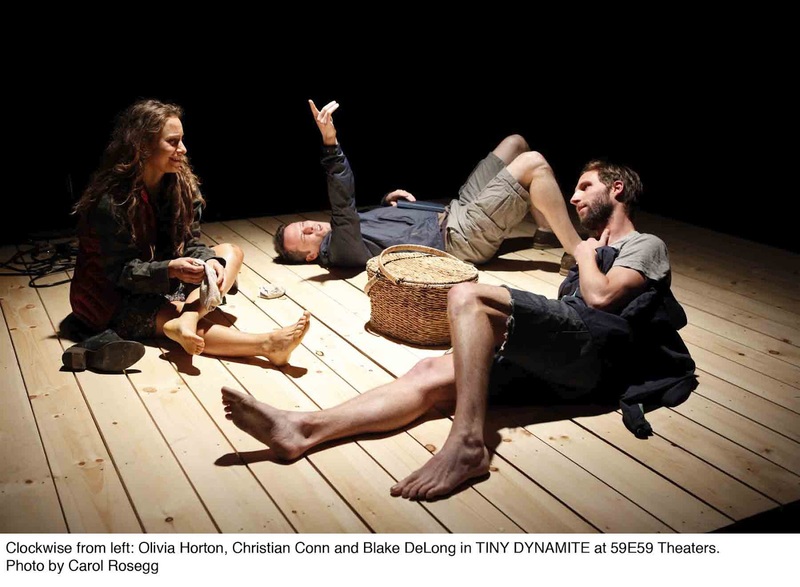 You can count on Origin to present plays for strong theatricality, like last summer’s Ivan and the Dogs, by Hattie Naylor. 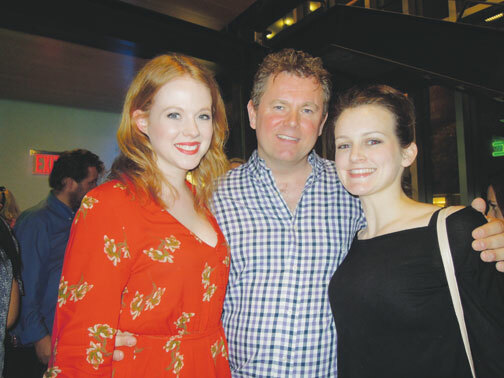 At the opening night party on Saturday, supporters and stars circulated in 59E59’s lobby: Origin’s Artistic Director George C. Heslin with Zoe Boyle and Sophie McShera, who played Lavinia and Daisy on Downton Abbey (and who both looked far more glamorous than their television characters); Consul General Noel Kilkenny and his wife Hanora; Angela Murphy (whose husband Gerry’s banana split we mentioned in our Teetotallers review last week); Lorraine Turner of the Northern Ireland Bureau, author Belinda McKeon, and many more. At these parties people generally say nice things about the play and then talk of current events, love, the weather. But Morgan’s powerful play, like shimmering fireflies, danced around the party and alighted on each conversation. Tiny Dynamite leaves a lingering after-glow.